A short film about blind ambition. Coach Cook: Now, I know that eye of yours is a handicap and that's O.K., I'm not here to take away your blue parking space. Courtesy of Epic Records and Sony Music Entertainment (Australia) Ltd. 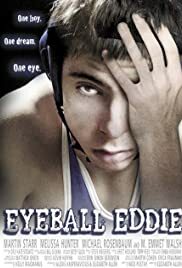 I recently was acquainted to Eyeball Eddie and was happily surprise with its quality and the talented team that work on this film. The actors were fantastic especially Martin Starr & Michael Rosenbaum!!! I enjoy every bits of it and a big Bravo to Elisabeth Allen, you did a great job!! !